UW Health's pediatric dietitians in Madison, Wisconsin, educate, counsel and equip children and families with the tools they need for a healthier lifestyle. Registered dietitians can help your family learn how to build a healthier meal, snack smart or even combat common food allergies. The main goal is to keep food fun while enjoying healthy eating. 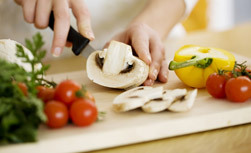 Whether you're hungry for a snack or an entire meal, it's easy for the whole family to eat healthy with these delicious recipes from UW Health's Pediatric Fitness Clinic.